pre-wires a variety of Mini Magnum Power Centers ranging from 2,000 to 17,600 watts of output. These easy-to-install power centers are ready to be connected to your renewable energy source, whether it be solar, wind or hydro power. Include easy-to-access battery monitor units that allow you to read the state of charge at any time in amps, volts or percentage of charge. And because the inverters are installed on Magnum MP or MMP plates, Magnum will warranty them for five years. You have the option of buying the Mini Magnum Center with our without an OutBack Flexmax or MIdnite 150 Charge Controller. Click on the systems below to see a complete list of components and options. Be sure to check in with one of our Sales Technicians to see how these systems could work for you. 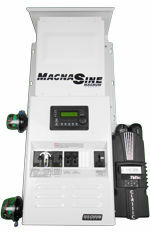 Four Star Solar Magnum Single MS4448PAE w/ no Charge Controller Power Center 1440000 4400W 48VDC Sold separately. Four Star Solar Expandable Single Magnum MS4448PAE One Inverter w/ No Charge Controller Power Center 1440055 4400W 48VDC Sold separately. Four Star Solar Magnum Dual MS4448PAE Power Center 1440040 8800W 48VDC Sold separately. Four Star Solar MS4448PAE Triple Magnum Power Center 1440089 13200W 48VDC Sold separately. Four Star Solar Magnum Quad MS4448PAE w/ no controller Power Center 1440129 17600W 48VDC Sold separately. Four Star Solar Magnum MS4024PAE w/ no Charge Controller Power Center 1440190 4000W 24VDC Sold separately. Four Star Solar Magnum Dual MS4024PAE w/ no Charge Controller Power Center 1440210 8000W 24VDC Sold separately. Four Star Solar Magnum Triple MS4024PAE w/ no Charge Controllers Power Center 1440251 12000W 24VDC Sold separately. Four Star Solar Magnum Quad MS4024PAE Power Center 1440264 16,000W 24VDC Sold separately. Four Star Solar MS4024 Single Magnum Power Center 1440186 4000W 24VDC Sold separately. Four Star Solar MS2812 Single Magnum Power Center 1440521 2800W 12VDC Sold separately. Four Star Solar MS2012 Single Magnum Power Center 1440501 2000W 12VDC Sold separately.